The news headlines explained the sudden jump in the S&P futures this morning by stating that “recession fears had faded.” Just like that. Overnight. I guess the fact that the housing starts report showed a 9% sequential drop in housing starts last month and and a year-over-year 10% plunge means that the housing market is no longer considered part of the economy. That report was followed by a highly negative March consumer confidence report which included that largest drop in the “present situation” index since 2008. What’s stunning about this report is that consumer confidence usually is highly correlated with the directional movement of the S&P 500. Obviously this would have suggested that consumer confidence should be soaring. 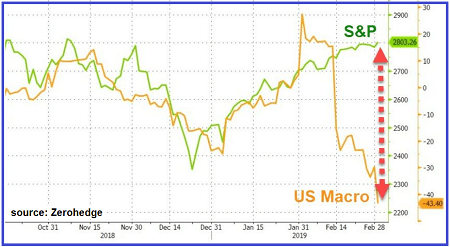 I explained to my Short Seller Journal subscribers that, once it became obvious the Fed would eventually have to start cutting rates and resuming QE, the stock market might sell-off. I think that’s what we saw on Friday. The “tell-tale” is the inversion in the Treasury yield curve. It’s now inverted out to 7 years when measured between the 1-yr and 7-yr rate. On Friday early the spread between the 3-month T-Bill and the 10-yr Treasury yield inverted. This has occurred on six occasions over the last 50 years. Each time an “officially declared” recession followed lasting an average of 311 days. The yield curve inversion is a very powerful signal that economy is in far worse shape than any Fed or Government official is willing to admit. the Treasury yield curve “discounts” economic growth expectations. An upward sloping yield curve is the sign that the bond market expects healthy economic growth and potential price inflation. An inverted curve is just the opposite. If you hear or read any analysis that “it’s different this time,” please ignore it. It’s not different. The inverted yield curve is broadcasting a recession. For many households, this country has been in a recession since 2008. That’s why debt levels have soared as easy access to credit has enabled 80% of American households to maintain their standard of living. The yield curve is telling us that credit availability will tighten considerably and the recession will hit the rest of us. This is what Friday’s stock market was about, notwithstanding the overtly obvious intervention to keep the S&P 500 above the 2800 level on Monday and today. The Fed’s abrupt policy reversal says it all. No more rate hikes (yes, one is “scheduled” for 2020 but that’s fake news) and the balance sheet run-off is being “tapered” but will stop in September. Do not be surprised if it ends sooner. Listening to Powell explain the decision or reading the statement released is a waste of time. The truth is reflected in the deed. The motive is an attempt to prevent the onset economic and financial chaos. It’s really as simple as that. See Occam’s Razor if you need an explanation. As the market began to sell-off in March, the Fed’s FOMC foot soldiers began to discuss further easing of monetary policy and hinted at the possibility, if necessary, of introducing “radical” monetary policies. This references Bernanke’s speech ahead of the roll-out QE1. Before QE1 was implemented, Bernanke said that it was meant to be a temporary solution to an extreme crisis. Eight-and-a-half years and $4.5 trillion later, the Fed is going to end its balance sheet reduction program after little more than a 10% reversal of QE and it’s hinting at re-starting QE. 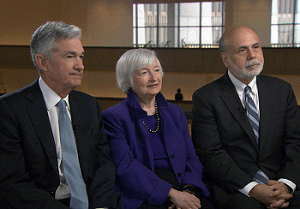 Make no mistake, the 60 Minutes propaganda hit-job was a thinly veiled effort to prop up the stock market and instill confidence in the Fed’s policies. Economic data is showing further negative divergence from the rally in the stock market. The Census Bureau finally released January new home sales, which showed a 6.9% drop from December. Remember, the data behind the report is seasonally adjusted and converted to an annualized rate. This theoretically removes the seasonal effects of lower home sales in December and January. The Census Bureau (questionably) revised December’s sales up to 652k SAAR from 621k SAAR. But January’s SAAR was still 2.3% below the original number reported. New home sales are tanking despite the fact that median sales price was 3.7% below January 2018 and inventory soared 18%. LGI Homes reported that in January it deliveries declined year-over-year (and sequentially) and Toll Brothers reported a shocking 24% in new orders. None of the homebuilders are willing to give forward guidance. LGI’s average sale price is well below $200k, so “affordability” and “supply” are not the problem (it’s the economy, stupid). The upward revision to December’s new home sales report is questionable because it does not fit the mortgage purchase application data as reported in December. New homes sales are recorded when a contract is signed. 90% of all new construction homes are purchased with a mortgage. If purchase applications are dropping, it is 99% certain that new home sales are dropping. With the November number revised down 599k, and mortgage purchase applications falling almost every week in December, it’s 99% likely that new home sales at best were flat from November to December. In other words, the original Census Bureau guesstimate was probably closer to the truth. The chart to the right shows the year-over-year change in the number of new homes (yr/yr change in the number of units as estimated by the Census Bureau) sold for each month. I added the downward sloping trend channel to help illustrate the general decline in new home sales. As you can see, the trend began declining in early 2015. Recall that it was in January 2015 that Fannie Mae and Feddie Mac began reducing the qualification requirements for Government-backed “conforming” mortgages, starting with reducing the down payment requirement from 5% to 3%. For the next three years, the Government continued to lower this bar to expand the pool of potential homebuyers and reduce the monthly payment burden. This was on top of the Fed artificially taking interest rates down to all-time lows. In other words, the powers that be connected to the housing market and the policy-makers at the Fed and the Government knew that the housing market was growing weak and have gone to great lengths in an attempt to defer a housing market disaster. Short of making 0% down payments a standard feature of Government-guaranteed mortgage programs, I’m not sure what else can be done help put homebuyers into homes they can’t afford. I do expect, at the very least, that we might see a “statistical” bounce in the numbers to show up over the couple of existing and new home sale reports (starting with February’s numbers). 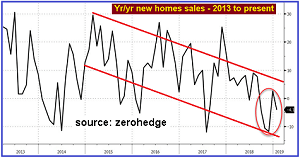 Both the NAR and the Government will likely “stretch” seasonal adjustments imposed on the data to squeeze out reports which show gains plus it looks like purchase mortgage applications may have bounced a bit in February and March, though the data was “choppy” (i.e. positive one week and negative the next). E-commerce sales for Q4 reported last week showed a 2% annualized growth rate, down from 2.6% in Q3. Q3 was revised lower from the 3.1% originally reported. This partially explains why South Korea’s exports were down 19.1% last month, German industrial production was down 3.3%, China auto sales tanked 15% and Japan’s tool orders plummeted 29.3%. The global economy is at its weakest since the financial crisis. It would be a mistake to believe that the U.S. is not contributing to this. The Empire State manufacturing survey index fell to 3.7 in March from 8.8 in February. Wall Street’s finest were looking for an index reading of 10. New orders are their weakest since May 2017. Like the Philly Fed survey index, this index has been in general downtrend since mid-2017. The downward slope of the trendline steepened starting around June 2018. Industrial production for February was said to have nudged up 0.1% from January. But this was attributable to a weather-related boost for utilities. The manufacturing index fell 0.4%. Wall Street was thinking both indices would rise 0.4%. Oops. The economy is over-leveraged with debt at every level to an extreme and the Fed knows it. Economic activity is beginning to head off of a cliff. The Fed knows that too. The Fed has access to much more in-depth, thorough and accurate data than is made available to the public. While it’s not obvious from its public posture, the Fed knows the system is in trouble. The Fed’s abrupt policy reversal is an act of admission. I would say the odds that the Fed starts printing money again before the end of 2019 is better than 50/50 now. The “smartest” money is moving quickly into cash. Corporate insiders are unloading shares at a record pace. It’s better to look stupid now than to be one a bagholder later. Just for the record, the Fed’s “Dot Plot” has to be one of the most idiotic props ever created for public consumption. It far exceeds the absurdity of the “flip chart” that Steve Liesman uses. “Money exits not buy nature but by law” – Aristotle – When Rule of Law breaks down, it enables bankers, via their Central Bank tentacles, to take control of the monetary system. The process is accompanied by the gradual collapse of the system upon which that money is predicated. This process can not occur unless a gold is removed from the system. The price of gold retested the $1300 level last week. Aggressive futures short-selling on the Comex took the price of gold below $1300 on Thursday last week. The price ambush failed to keep gold below $1300, as strong Indian demand and a growing expectation that the Fed will stop its balance sheet liquidation and eventually re-start QE. 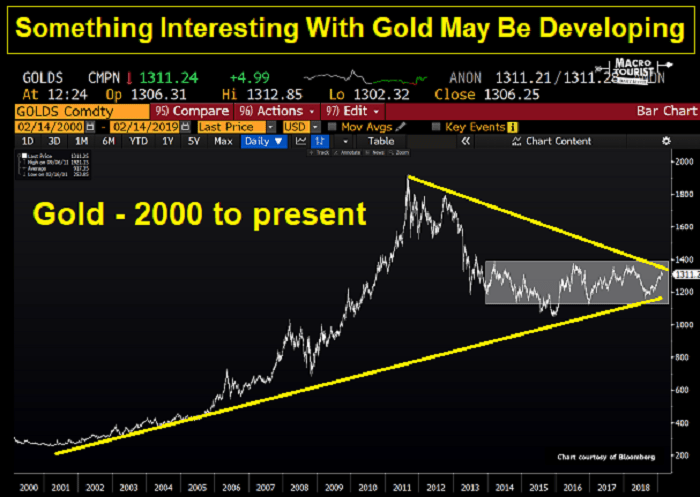 A lot of current precious metals and mining stock investors were not around for the 2008-2011 bull run and even less were around for the 2001-2006 bull run. The move from January 2016 to July 2016 was a head-fake that was part of the long period of consolidation shown in the chart above. Many of you have not experienced how much money can be made investing in junior mining stocks when a real bull move takes place. 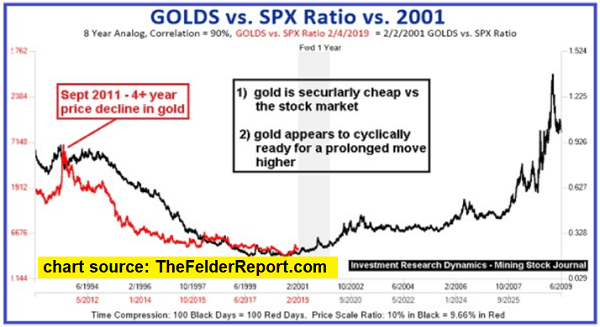 The chart above shows how cheap gold is vs. the SPX. Similarly, the mining stocks in relation to the priceof gold are almost as cheap as they were in 2001 and the end of 2015. In 2016 the GDXJ ran 300% from January to July. But in 2008, the HUI ran from 150 to 300 in 60 days and then from 300 to well over 600 over the next 2 1/2 year. Many juniors increased in value 10-20x. The move from 2001-2006 provided the same type of excitement. I believe the long period of consolidation in the precious metals sector is finally ending. While there’s always the possibility that it could drag on longer, the risk/reward for investing in the juniors right now is as highly skewed toward “reward,” as it was in 2001 and 2008. The market will not go straight up and there will be some gut-wrenching, manipulated sell-offs. But I believe patience will be rewarded. This means not going “all-in” all at once but wading in slowly over time. More eye-raising for me was the warning issued by the BIS (Bank for International Settlements – the global Central Bank for central banks). 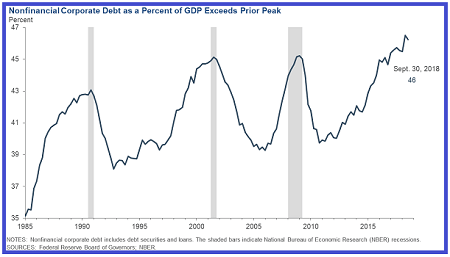 The BIS warned that the surging supply of corporate debt, specifically the amount of BBB-rated debt, has left the credit market vulnerable to a crash once the economic weakness triggers ratings downgrades. A large scale ratings downgrade of triple-B issuers to junk would cause an avalanche of selling from funds which can’t hold non-investment grade debt. This has the potential to seize-up the credit markets. The BIS would not issue a warning like this unless it was already seeing troubling developments in the numbers to which it has access. Recall that leveraged loan ETFs plunged in value the last two months of 2018. Same with high yield bond ETFs, though the drop in leveraged bank loans was more troubling given their status as senior secured and ahead of junk bonds in the legal pecking order. Just like the stock market, fixed income prices rallied sharply after the Fed and the Trump Government acted to arrest the sell-off in the stock market in late December. But this was always a short-term “fix,” as economic fundamentals continued to deteriorate, perhaps at a hastened pace because of the Government shutdown. But neither the shut-down nor the trade war are the causes of the collapsing global economy. 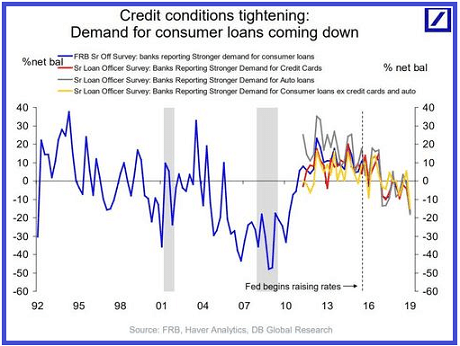 More evidence the consumer is tapped out – Deutsche Bank wrote a report detailing signs that the average U.S. household is running up against its willingness and ability to assume more debt and monthly interest expense. I have been suggesting this was the case for a few months in SSJ. One indicator I thought was interesting is a chart showing that the average hours worked in sectors selling “big ticket” items is now declining (home furnishings, travel arrangement and reservation services and used car dealers). One of the reasons for the drop in loans is simply that the average consumer simply can not afford the monthly cost of taking on additional debt, especially higher-cost credit card and auto debtl. Just as significant is the fact that interest rates on these types of loans are rising quickly – i.e. the average credit card interest rate is now 17% vs 14% a year ago. Deutsche Bank omits to explain why the interest rate on these types of loans is rising much faster than the Fed funds. The interest rate charged on a loan reflects the “risk free” rate (Fed funds), the time value of money and – most important – the inherent risk associated with specific types of loans. Interest rates on credit cards and auto loans are rising to reflect the increased risk attached to these forms of credit – i.e. the rising delinquency and default rates. 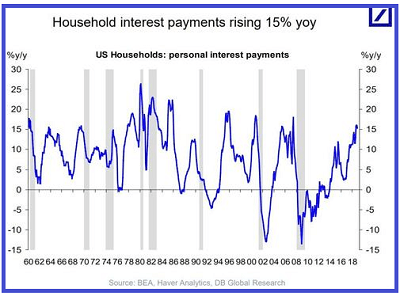 The aggregate household interest payment has soared at a 15% Y/Y rate. Interest payments as a share of total household spending have jumped to the highest level since the financial crisis. Virtually every prior time when interest payments spiked this much, a recession promptly followed. Last but not least, as Treasury debt hits a new record every day, it was reported by the Treasury that the U.S. budget surplus in January, traditionally one of the only months of the year with a spending surplus because of tax receipt timing, was only $9 billion. This missed the consensus estimate of $25 billion and was far below the January 2018 surplus of $49 million. For the first 4 months of the Government’s fiscal year, the budget deficit was $310 billion, 77% higher than the $175.7 billion deficit for the same period last year. The budget deficit will surely be much higher than the $1.2 trillion annualized rate recorded in the first four months of this FY. Federal interest expense hit a record high for the four-month period. Annualized, the projected $575 billion interest expense alone for FY 2019 would be more than the entire budget deficit in FY 2014. Finally, the Deutsche Bank report showed two graphics showing the “current conditions” index for buying cars and homes for the top 33% of households by income. The index measures the intent to make a purchase. The current conditions index for car purchases was at its lowest since 2012. For home buying, the intent to purchase index was at its lowest since 2008. “Collateral Consequences.” It was a term introduced to the Executive branch of Government, which includes the Justice Department by Eric Holder during the Clinton Administration. This paved the way for Justice Department prosecutors to let bankers off the hook for obvious criminal behavior. In a 1999 memo entitled “Bringing Criminal Charges Against Corporations” (section IX on page 9) written when Holder was deputy U.S. attorney general, Eric Holder argued that government officials could take into account “collateral consequences” when prosecuting corporate crimes. By this he meant prosecutors should take into account the effect prosecuting a corporation or corporate individual will have on “innocent third parties.” That principle right there gave the keys to to the kingdom to the banks. It also explains why the SEC is so reluctant to prosecute Elon Musk. This “consider collateral consequences to innocent 3rd parties” is what led to the bailout of the banks in 2008 and the absence of any criminal prosecutions against bank executives despite the overwhelming evidence of culpability. Oh by the way, Eric Holder just happened to be appointed Attorney General in 2009 by Obama to make sure that Section IX of Holder’s 1999 memo held up during the period of time when the banks and their CEO’s should have been held accountable and sent to jail. Jerome Powell [was] wheeled out on CBS’s 60 Minutes Sunday night, like a cigar store Indian at an antique fair, so vividly sculpted and colorfully adorned you could almost imagine him saying something. Maybe it was an hallucination, but I heard him say that “the economy is in a good place,” and that “the outlook is a favorable one.” Point taken. Pull the truck up to the loading dock and fill it with Tesla shares! I also thought I heard “Inflation is muted.” That must have been the laugh line, since there is almost no single item in the supermarket that goes for under five bucks these days. But really, when was the last time you saw a cigar store Indian at Trader Joes? It took seventeen Federal Reserve math PhD’s to come up with that line, inflation is muted. And so it went on 60 Minutes on Sunday evening. I strongly recommend reading Kunstler’s entire essay: Ides and Tides…The Fed and the FOMC are not mandated to set monetary policy to stabilize employment and inflation. The Fed’s role is to help the banks maximize profits. That’s it in a nutshell.